I am off to explore all the best things to do in LA with kids soon. 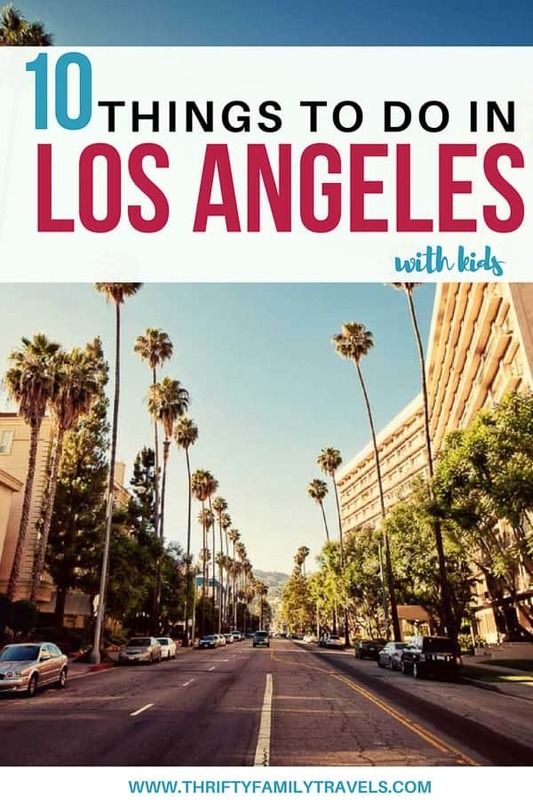 Now I have visited Los Angeles quite a few times but all prior to little Myla coming along, so I asked some of my fellow travel bloggers for their tips on the best things to do in LA with family. 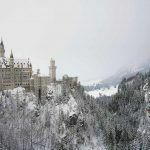 Of course Disneyland and the Hollywood sign are some of the first LA tourist spots that come to mind when you think of the Los Angeles attractions for kids, but you may well be surprised at some of the recommendations in this post. So check it out 10 of the best things to do in LA with family. The Hollywood sign has been seen in countless movies and pictures, but wouldn’t it be cool to see it up close in person? You can do just that! And its one of the free things to do in LA with kids. There are several different trails that will all take you to the Hollywood sign, but one of the shortest and easiest is the Charlie Turner Trailhead. It’s about a 3-mile trek and below 1,000 feet in elevation, making it a relatively easy hike for kids and pets. Not only does it bring you pretty close to the Hollywood sign, but you can also get some amazing view of the city and the Griffith Park Observatory as well. Once you’re done visiting the Griffith Tower Observatory, head over to the opposite side of the parking area to find the beginning of the Charlie Turner trail. Make sure you are well stocked up on water before heading out, as it can get quite hot on the trail and you will likely be out there for around 2 hours. Also make sure that everybody wears good hiking shoes, as a few spots can be a little steep. For discounted tickets to LA attraction – book through Klook – Click here to see how much you can save! The Hollywood Walk of Fame is certainly one of the fab places to visit in Los Angeles with kids. 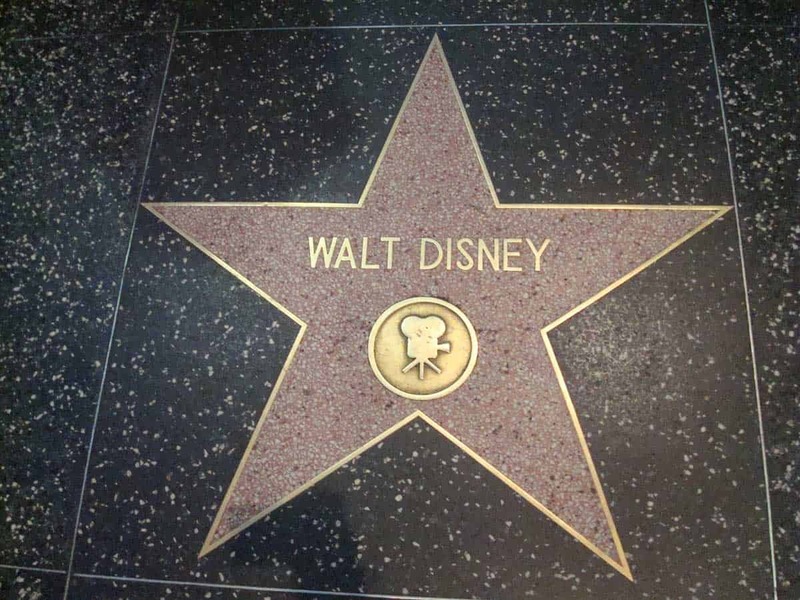 Take a stroll down Hollywood Boulevard where your kids can spot their faves amongst the 2500+ stars. For a full directory of the stars, check out the Walk of Fame website. As you’re walking you’ll probably come across Batman, Catwoman, Iron Man, Spiderman – all the superheroes are here. If your kids stop to take a photo or engage with the performers, it’s expected that you’ll tip. There doesn’t seem to be a recommended amount, but most agree that $5 is plenty (and less is fine too). Once you’re done walking, head into the Hollywood and Highland centre, located right on Hollywood Boulevard. This mall is the home of the Dolby Theater (where the Oscars are held each year) and it’s also a pretty good place to get your sugar fix. Check out Sweet! on the top floor for some creative candy displays and souvenirs. There are plenty of places to eat here that are kid-friendly. Try California Pizza Kitchen or Johnny Rockets for easy kids meals. If you’re really pushed for time, the Walk of Fame is included in most Hollywood hop on hop off tours. 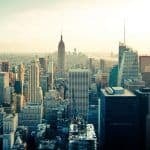 These tours are great value and go everywhere you need to go (plus you don’t have to deal with the LA traffic). Griffith Observatory is one of the fabulous places to go in LA with the kids. Not only does it have panoramic views over LA but also one of the best views of the Hollywood sign from the entrance and balconies. Best of all, entrance to the observatory is free. The exhibits are tailored to both adults and kids, and tell the story of space – including the Foucault Pendulum which demonstrates the earth’s rotation, the ‘Hall of the Sky’ all about the sun and moon, the ‘Hall of the Eye’ with information on astronomical instruments through the ages, and our favourite the ‘Depths of Space’ with loads of information all about the planets and our solar system. Look out for the free daily shows which are specifically tailored for kids. We loved the ‘Let’s Make A Comet’ demonstration showing how to make your own comet at home using common household ingredients! It was super educational as well as totally engaging for adults and kids alike. There are also a number of other programmes and lectures available for a small charge. 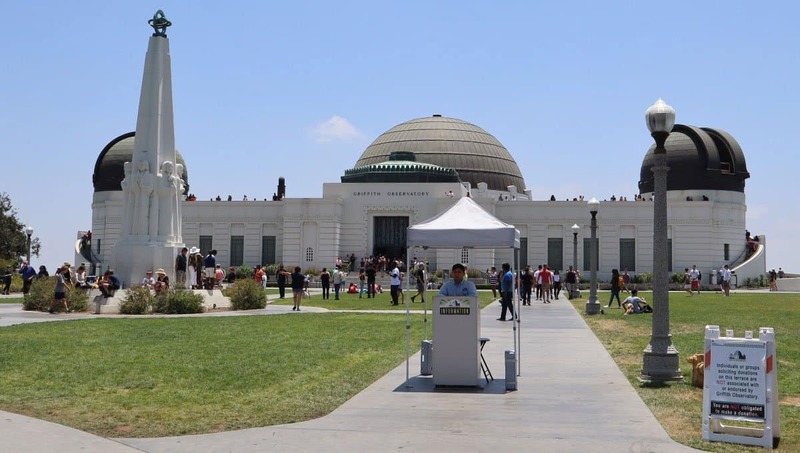 Griffith Observatory is open Tuesday to Sundays. Parking is available on-site, and frequent buses operate from the Vermont/Sunset Metro Red Line. We caught an UBER from our hotel which was cost-effective and easy. Do you need a travel stroller for your LA trip? Click here to read my tips on the best lightweight stroller for travel. 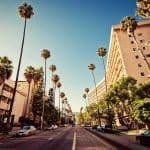 A trip to LA usually includes plenty of theme parks, movie industry attractions and a visit to one of the city’s many shopping areas. 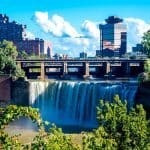 But visitors who overlook the amazing local outdoor activities are missing out on the best of what the city has to offer! LA is a surprisingly great place for hiking with kids, as mountains criss-cross the city center in nearly every direction. There are plenty of great options, but our favorite is the 2.6mi loop at Temescal Canyon in Pacific Palisades. The trail is great for ages 5 and up (no dogs allowed) and younger ones can enjoy the ride in a carrier. It does have some steep sections and part of the trail is unshaded, but you won’t mind too much thanks to the stunning coastal and mountain views, lovely waterfall and copious wildflowers in the spring. If you’re looking for more of a challenge, there are lots of extension available. Parking on-site is $7 (cash only). We recommend this trail October through April when temperatures are mild, though mornings in May and June can also be pleasant thanks to the local “June gloom”. We recommend bringing a comfortable day backpack, a picnic lunch or snacks to enjoy at the top where the views are best, sunscreen and one litre of water per person. Click here for 15 day trips from Los Angeles. One of the best things to do in LA (which your kids will love as well!) is a walk around the famous Rodeo Drive in Beverly Hills. 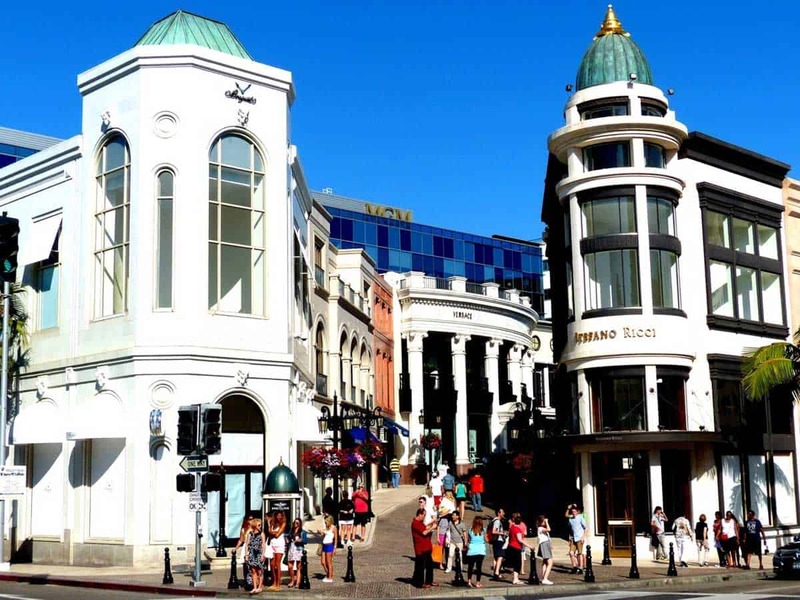 This street is considered to be the most expensive shopping street in the world and while most people will probably not be able to go on an extensive shopping tour here, the rodeo drive is still a fun place to visit. What I like most about rodeo drive is that there’s so much to see! Fancy stores, super expensive cars, rich and beautiful locals spending their money – you certainly won’t get bored! If you’re lucky, you might even have the chance so spot some celebrities or to see a few paparazzi hanging around. By the way, the rodeo drive is also the spot where you can find a replica of the famous Beverly Hills sign, which is great as a picture spot. Finally, the Rodeo Drive is located directly in Beverly Hills and therefore a visit can be easily combined with some of the other attractions in LA, such as a drive around Beverly Hills in order to spot some of the fancy and expensive mansions. 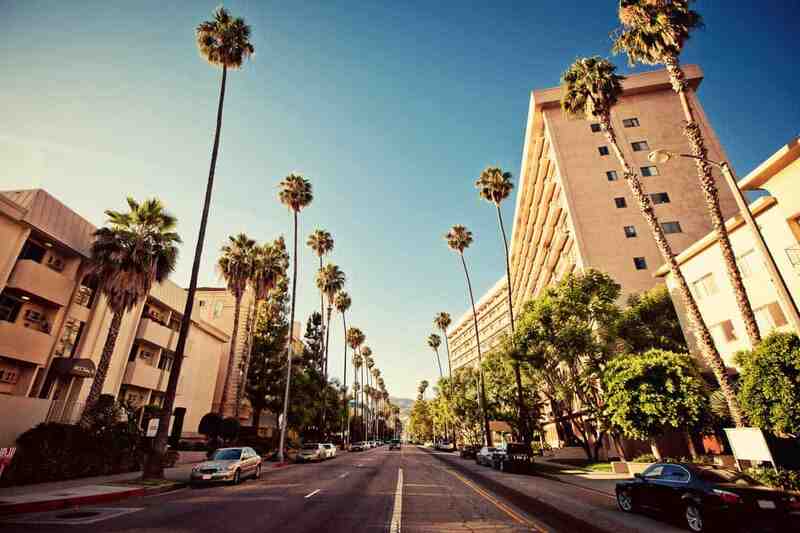 LA is known to be home for the rich and famous, and the rodeo drive is the spot where you will find them! 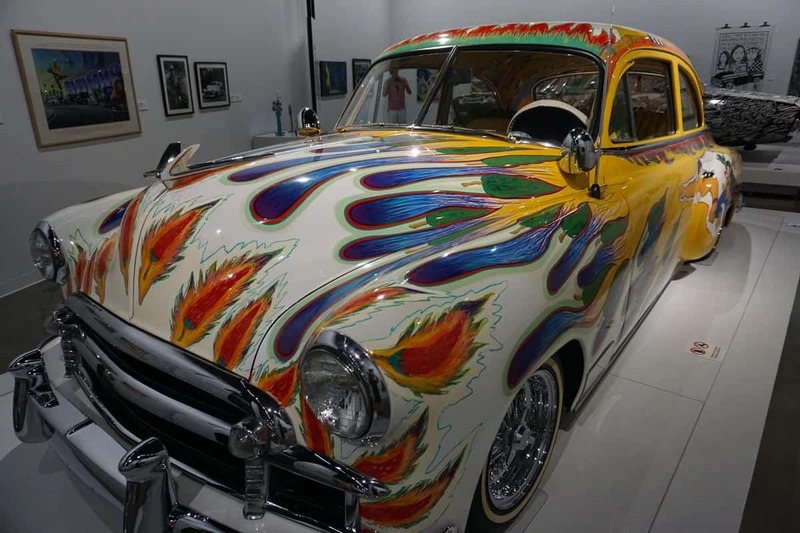 With an amazing array of things to do in Los Angeles, the Petersen Automotive Museum may not be the first place that comes to mind for families visiting, but it should be as a visit here is one of the fun things to do in LA with kids. This museum opened in its new and larger space in 2015. Now this large red building covered in silver waves sits prominently on the corner of Wilshire and Fairfax and can’t be missed. Inside are three floors packed with historic, colorful and fascinating cars. The top floor features cars from famous Hollywood movies and television shows including a Batmobile and Batcycle. The next floor features a variety of exhibits including a terrific kids area. And the first floor features both a Porsche collection and a lowrider exhibit. The museum is open daily from 10 a.m. to 6 p.m. and admission is $16 for adults, $13 for students and $8 for children. For exceptionally passionate car lovers, an additional exhibit is available called “The Vault”. There are three other museums (including La Brea Tar Pits) within walking distance, so this section of LA, called The Miracle Mile, could offer an entire day worth of activity. 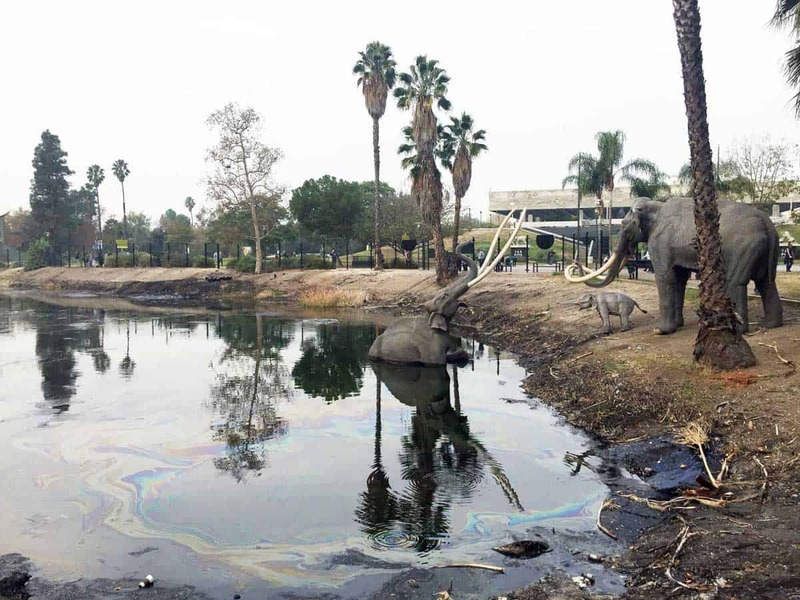 The La Brea Tar Pits have been around for tens of thousands of years. The liquefied asphalt pits have accidentally preserved many trapped animals in the past 38,000 years. It is a dream world for archeologists and kids alike. Thousands of prehistoric fossils and bones of all kinds of animals have been excavated to date, including hundreds of mammoths and saber-toothed cats. While many active outdoor excavation pits exist on the La Brea Tar Pits grounds, the gem is kept inside the Museum. The La Brea Tar Pits Museum is a fun and educational place for all, especially kids. There are activities to do for all ages, including excavation kits, a kids’ guide to the La Brea Tar Pits, and an Ice Age Encounters show. If you’re lucky, your kids can meet face- to-face with a life-size saber-toothed cat puppet! A great place if you’re looking for fun things to do with kids in Los Angeles. Tickets are $25 for adults and $17 for children ages 2-12. Military, students, seniors and group discounts are also available. Hours of operation are 9:30-5pm and admission is waived the first Tuesday of every month. In general, Los Angeles is a sprawling city. You will be better off if you have your own private vehicle to get around, especially when traveling with little kids. Keep in mind, however, that private parking in a nearby official parking lots is $15. Are you looking for a new backpack that’s perfect for carry on only travel? Click here to read my tips on the best backpack for travelling carry on. Santa Monica Pier is in the LA Suburb of Santa Monica. It’s on the beach and it is the official end of the world famous Route 66. To get there you can drive and park either in the beach carpark or at one of the many car parks close to the pier. There will be bus services too but a car really is the way to get around LA. The Pier is an icon, built over 100 years ago. It is made up of rides, restaurants and arcade games. It’s free to enter and all rides and activities are pay per use. There are also a number of souvenir shops. There is a range of eateries, from my favourite, Bubba Gump, to pizza or Mexican, to more carnival food options. 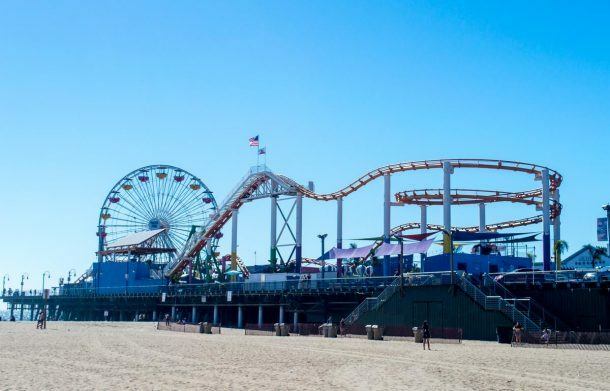 Late afternoon is the best time to head to the pier, spend the afternoon on the beach then head to the pier for sunset – it’s the perfect time to ride the ferris wheel. Then get yourself some food and spend the evening playing on the rides and arcade games. Santa Monica Pier is certainly one of the cool places to go in LA with the kids. 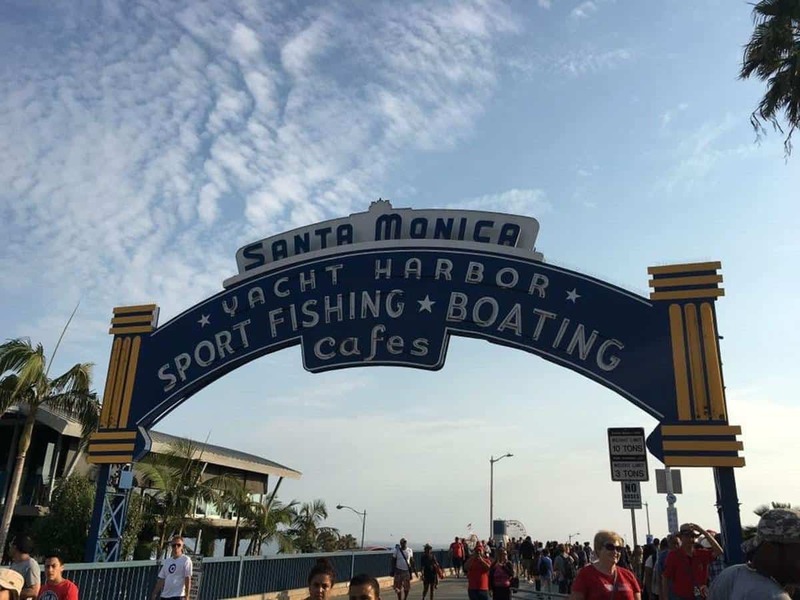 Santa Monica Pier is open all year round, 24/7, but check with the vendors for specific opening times. For more information visit the Santa Monica Pier website. Unfortunately we only had half a day in LA after visiting all the theme parks. We decided to grab a hire car and conduct our own self guided tour. That took us to Venice, we parked the car and went for a stroll along the Venice Boardwalk. I first noticed the beach front was extremely wide and there were loads of people out and about enjoying the evening even though it was December which is considered their winter. We explored the funky stores along the Venice Boardwalk and I bought myself a Venice Beach t- shirt. We walked up to the famous Muscle Beach and just past there is the Santa Monica Pier. We sat on Muscle Beach and watched life go by and the kids had a play at the playground. This area has been converted into a mini tent city with a large number of homeless people residing there. This was a common sight across many parts of America that I was that was both confronting and shocking to see. We bought ice creams and slowly made our way back to our car while taking in one of the most spectacular sunset. It started yellow and orange and finished a lovely hue of pink. We stopped in front of what I call the BayWatch life saver stations and watched the sky change all different and beautiful colours. Many of the locals and tourists were out on either roller blades or riding push bikes. It really would have been a lovely spot to stay a few days and enjoy a few more of those awe-inspiring sunsets. 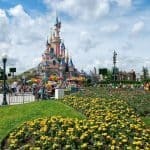 I know that it’s really tough to use Disneyland and frugal in the same sentence, but I’m here to provide you with money and time saving tips to help maximize one day at Disneyland. Where to Stay: Anaheim Marriott or any other off-site location where you can use points and provide a shuttle or is walkable distance to the park. This particular hotel was walking distance to Downtown Disney, Disneyland and California Adventure. We took advantage of the concierge lounge breakfast offerings and filled our tummies prior to walking to the park. If you’re going to eat one meal at the park, make it lunch. We enjoyed sharing several large size adult meals at Plaza Inn and this held us off until a late dinner after a full 12 hours of Disney fun. 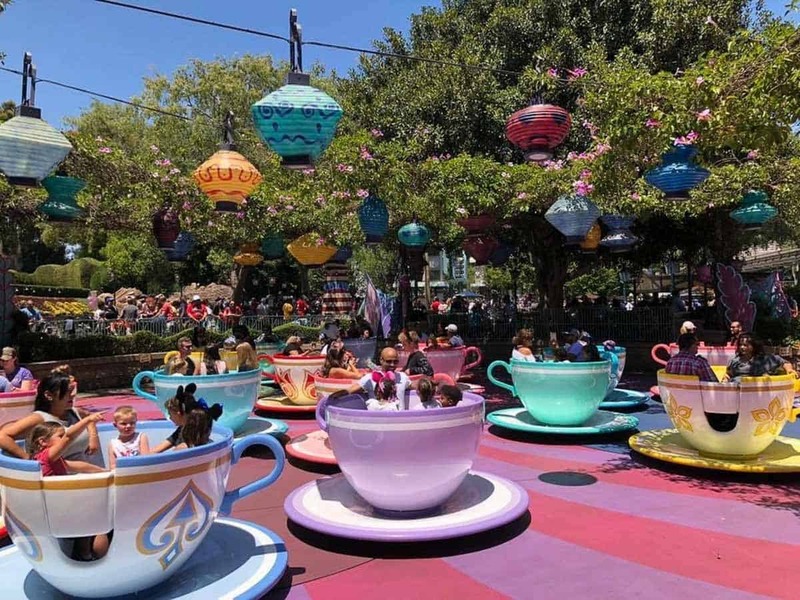 Disneyland is the original Disney park, (opened in 1955) located in Anaheim just outside of LA and it’s the only Disney Park designed and completed under the direct supervision of Walt Disney. Get there early and if you have Start Wars fans head with the kids right to the Star Wars Launch bay to sign them (ages 4-12) up for Jedi Academy. – Make your own autograph books and bring sharpies from home. Buy shirts, ears and just about anything Disney before your trip. My youngest daughter’s Mickey ears were so unique that many people stopped me at the park asking where I got them. I answered with a money saving grin: Target. Seriously, check out Target’s new Disney Park offerings prior to stepping foot in Disneyland. Bring your own refillable water bottles. Disneyland offers free water bottle filling stations throughout the park. Visit during the off season. Disneyland’s ticket information calendar list varying prices depending on the time of year. Being flexible will save you money. Disneyland as a family of six is not a cheap endeavor, but by doing research and being prepared, we maximized or investment and created once in a lifetime memories. Purchase your discounted Disneyland Passes from Klook – click here and SAVE! For discounted attractions prices, I recommend booking through Klook. Click here for a full list of available attractions in Los Angeles and see how much money you can save! 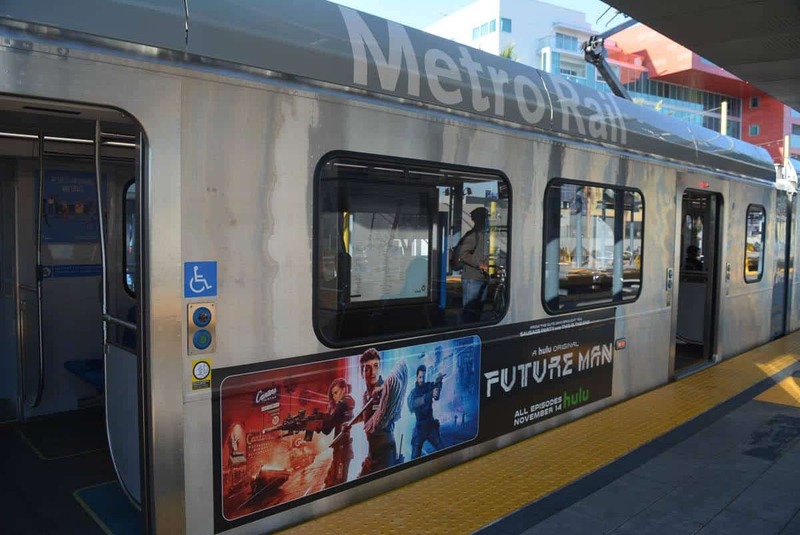 The Metro in Los Angeles is one of the newest in the world and still very much under construction but a budget-friendly option for traveling families staying in downtown LA. Its six lines have limited routes, but we traveled by Metro from downtown to Hollywood/Highland on the Red Line for $1.75 for each adult ride and $1.00 for children in grades K-12. The Metro station and car were both clean. It was easy to use the Metro map and follow the well-marked signs, and we reached Hollywood in less than 20 minutes and exited right to the Dolby Theater in the middle of Hollywood Boulevard. Our Metro experience was so pleasant that we took it to Santa Monica the next afternoon. Because rush hour had begun, the one-way Uber fare to Santa Monica averaged between $50-$60 each way. However, our combined Metro fare was under $10 round trip. Our ride on the Metro Expo Line took about 45 minutes. Most of the ride was above ground, so we enjoyed the cityscapes during our journey and even caught a glimpse of the Hollywood sign. It was so much less expensive than a rideshare or taxi and had the added bonus of no traffic delays. 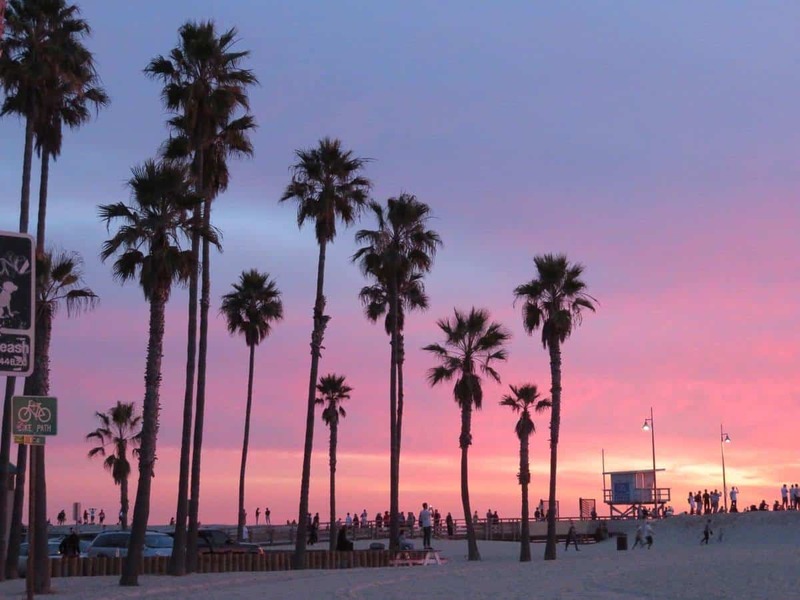 Whilst you spend time exploring all the attractions in Los Angeles it is recommended that you stay in one of the areas such as Hollywood, West Hollywood or even Santa Monica. This will mean you won’t be spending all your time traveling between attractions. Click here for family friendly places to stay in Los Angeles. If you are spending a few days at Disneyland, it’s best to do this at the beginning or end of your trip and stay somewhere close by in Anaheim. Click here for family friendly places to stay close to Disneyland.